Red bowtie and cap are his trademark. The Space Cap Droid, works in the hanger as the Coat Check. 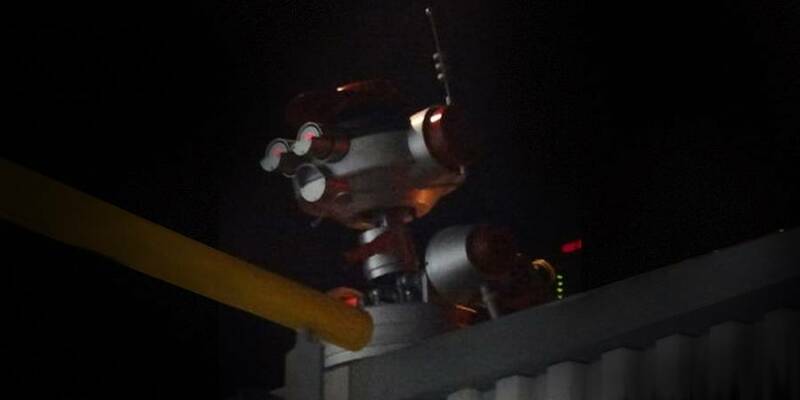 This droid is most likely an updated model of the classic RC-101 “redcap” droids, which date back to the Clone Wars, when such robo-porters were employed throughout the galaxy, even on such far-flung worlds as the planet Drongar. Records show an RC-101 model helping to offload passengers at a Republic Mobile Surgical Unit (Rimsoo) two years after the Battle of Geonosis. The RC-101’s wartime function was to load and unload personnel and materiel from the shuttle transports which regularly travelled between the planet-bound Rimsoos and the MedStar in orbit above Drongar. The design of the Clone Wars-era “baggage droids” featured a hamper for carrying luggage. The Information of this droids comes from a Japanese ‘Spot The Droid’ poster. Translated for EndorExpress by Martin Thurn.